Published by Family Roots Publishing Company, Volume 3 of the German Map Guide series was published in 2004, and updated in 2008, including a new introduction by Leland K. Meitzler. It has been acclaimed by genealogists everywhere. Written in English by Kevan Hansen, the volume was principally written to help family historians resolve where their family may have gone to church – and left vital records behind that may be seen today. This is the third of a series covering all of Germany The series is still in progress. Identifies the parish where an ancestor worshipped based on where they lived. Gives the FHL microfilm number for the family's parish records. Identifies nearly every city, town, and place that included residents. Visually identifies church parishes for Lutherans & Catholics in each district. Identifies adjoining parishes in case an ancestor attended an alternate parish. Aids in area searches, particularly across district or regional borders. Provides visual identification of search areas in which to look for a family. Helps in determining proximity of one area to another. Aids in determining reasonable distances of travel from one area to another. Identifies population centers in each parish. Identifies archives, repositories, and other resources. Aids in identification of the location of minority religions. See the user's comments at the end of this listing - after the following index. The Map Guide to German Parish Registers - Grandduchy of Hessen is a most impressive beginning for a series of extremely important German genealogical mapping resources. Unlike ordinary German gazetteers and histories, this meticulously organized reference book provides invaluable assistance in homing in on the specific parish needed to help locate your family’s ecclesiastical records. The book is easy to use and makes locating towns referenced in genealogical documents and historical references a snap. Kevan M. Hansen’s work is sure to become a definitive reference work for German genealogists everywhere. Brilliant! 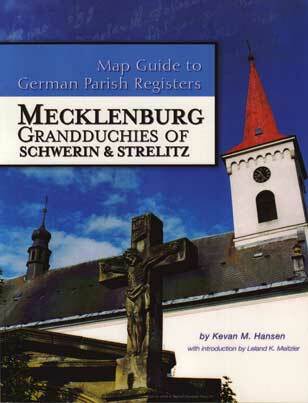 This book will save you endless hours of frustration in attempting to determine which German parishes to look in for the church records of your ancestors. Not only can you instantly locate where your ancestor most likely went to church, but these clear, easy to read maps show the surrounding parishes - complete with the Family History Library microfilm numbers for each. Since most German immigrants to the US from 1709 to the 1870's came from the Grandduchy of Hessen this book is exactly what genealogists will need. Libraries will want a reference and a circulating copy of this book. Thanks to the Map Guide to German Parish Registers - Grandduchy of Hessen, I found my Great Great Grandfather's Baptism. I had been searching for the parish for 6 years and thanks to Kevan Hansen’s book, I found him. I probably would have found it without the Map Guide, but who knows how many years it would have taken. I can't wait for Hessen-Nassau book to come out. Our Genealogy Library is just THRILLED that you have decided to publish this wonderful resource. It is heavily used by the library patrons and they will be excited to know that further volumes will be printed.